In a recent May 10, 2016 decision out of the Federal Western District Court of Pennsylvania in the case of Schutte v. GEICO, 2:16-cv-00374 (W.D. Pa. May 10, 2016 Schwab, J. ), Judge Arthur J. Schwab denied a Plaintiff’s Motion to Remand a post-Koken UIM claim back to the state court. According the Opinion, the Plaintiff originally filed a lawsuit against GEICO alleging breach of contract, bad faith, and loss of consortium in the Allegheny County Court of Common Pleas. That case was removed by GEICO to the federal court. The Plaintiff responded by filing a Motion to Remand the case back to the state court. The Plaintiff contended that the language of the forum selection clause precluded the Defendant’s right to remove the case from state to federal court. The Plaintiff further asserted that, as the filing party, the forum selection clause gave to the Plaintiff the sole discretion to choose whether to proceed in state or federal court and that GEICO allegedly contractually agreed to defer to that selection and waive right to move to federal court. The Plaintiff alternatively argued that the forum selection clause was ambiguous and should therefore be construed against the carrier, which drafted the language. The court rejected the Plaintiff’s argument and accepted the carrier’s argument that nothing in the forum selection clause could reasonably be construed as a waiver of the right to remove the case or as a consent to submit to the Plaintiff’s chosen forum. The court further stated that the clear and unequivocal language of the policy provided that the Plaintiff may file suit in either the state or federal court in a county in which they reside. The court found that the Plaintiffs did file suit in a forum of their choice but that the Defendants were well within their rights as well to remove the action to federal court. The court otherwise found that the jurisdictional requirements for federal court jurisdiction were met in terms of diversity of citizenship and alleged value of the case. Accordingly, the Plaintiff’s Motion to Remand was denied. Anyone desiring a copy of this case may click this LINK. 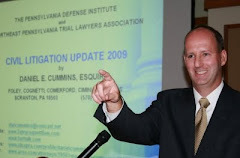 I send thanks to Attorney Joseph Hudock of the Pittsburgh law firm of Summers, McDonnell, Hudock, & Guthrie, P.C. for bringing this case to my attention.